The video game industry is a relatively small and tight-knit community, and most of the opportunities for the games I’ve developed came to me through someone I had previously known. 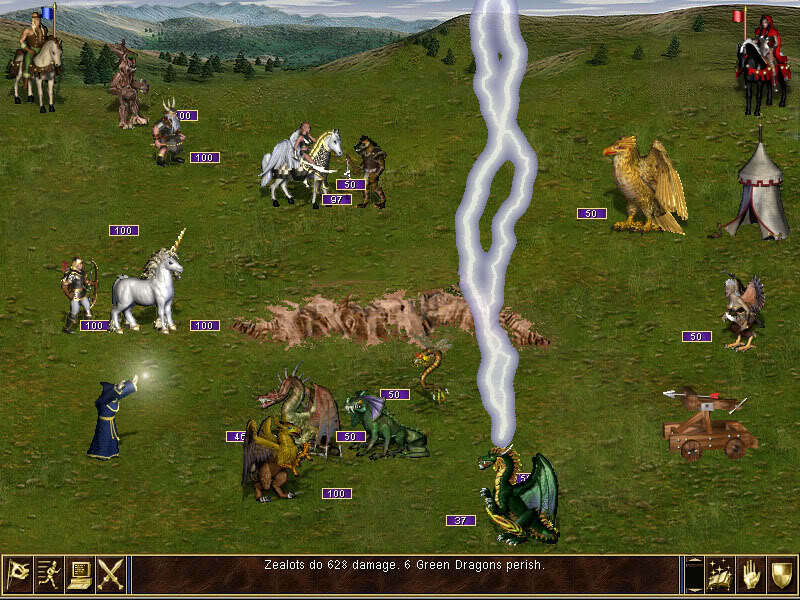 Heroes of Might and Magic III was no exception. I first met Jon Van Caneghem, the founder of New World Computing and chief designer of most of its games, in 1994. We were both speakers on a panel about “The Art and Craft of Game Design” at the annual Game Developers Conference in San Francisco. Jon was familiar with some of the games I had worked on in the past, such as Disney’s “DuckTales” and Harlan Ellison’s “I Have No Mouth, And I Must Scream”, and suggested that we should work together sometime. That opportunity came three years later when New World Computing contacted me about becoming director for a new sequel in the Heroes of Might & Magic franchise. 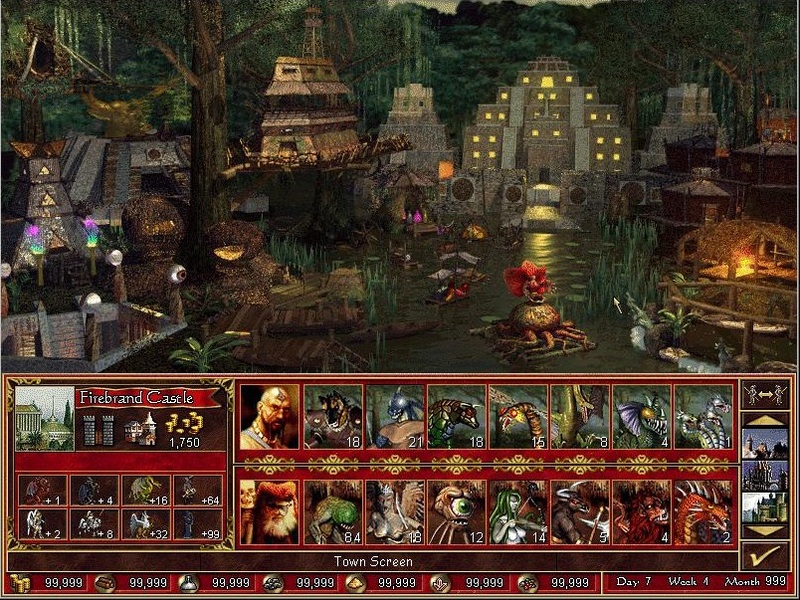 It was an exciting proposition but also a somewhat daunting one – Heroes of Might & Magic II, which was released the previous year, had just been named the sixth-best PC game of all time by PC Gamer magazine. What could I possibly do for an encore? That is precisely the question I was asked by Trip Hawkins, president of The 3DO Company, which had recently purchased New World Computing. Trip made it the habit of personally interviewing every key employee joining the 3DO family (in my case, it was a phone interview, since I lived in the Los Angeles area, where New World was located, whereas The 3DO Company was based in the San Francisco area), and he wanted to know what I brought to the party. Fortunately, I had an answer ready. 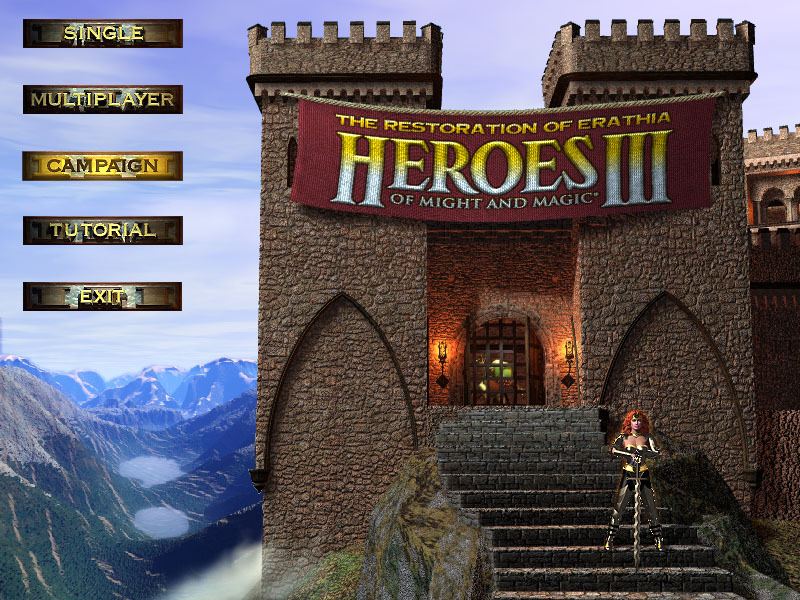 I had spent about a week playing Heroes II and found it to be a remarkably addicting and well-designed game. However, my one qualm was with the art style. I thought the artwork looked about five years behind the times, and so my focus would be on bringing the graphics up to current standards. Trip seemed satisfied with my answer, and I could only hope that my bosses at New World agreed with me. It turns out, they did. On my first day on the job, my manager told me that the company was unhappy with its current art direction and wanted me to “secretly” find a new art director among the art staff. So, on the pretense of introducing myself to everyone, I held one-to-one conversations with each artist. They were all capable artists, but one, Phelan Sykes, used our discussion to talk about how unhappy she was with the status quo. “I have found my art director”, I told myself, and as I later discovered, she was also the most talented artist in the company. Another person I was happy to meet was Greg Fulton, a new employee New World had hired to be the lead designer the Heroes of Might & Magic III team I was putting together. Greg was hired on the same day I was, and we had never met each other previously, but we quickly became fast friends. I told Greg about my plan for upgrading the franchise’s art style from its past cartoony look to one that I called “extreme fantasy.” Greg showed me some artwork from the Warhammer tabletop miniatures game, proving to me that he knew exactly what I meant. Together we went through galleries of fantasy artwork created by such great artists as Boris Vallejo, Larry Elmore and Rowina Morill, picking out images of heroes, creatures and environments that captured the look we were going after. We then arranged our collection into eight themed factions, up from the six that were featured in Heroes II. My attention then turned to programming. My team started with only one programmer, George Ruof, who had worked on Heroes II. For the rest, I had to go outside the company, because the other staff programmers were dedicated to the studio’s other franchise, the Might & Magic role-playing game series. Luckily, my search didn’t take long as I was able to bring on two talented engineers who had programmed “I Have No Mouth, And I Must Scream” for me at another company – John Bolton, who I assigned to be lead programmer, and David Richey, who I hired as level editor programmer. 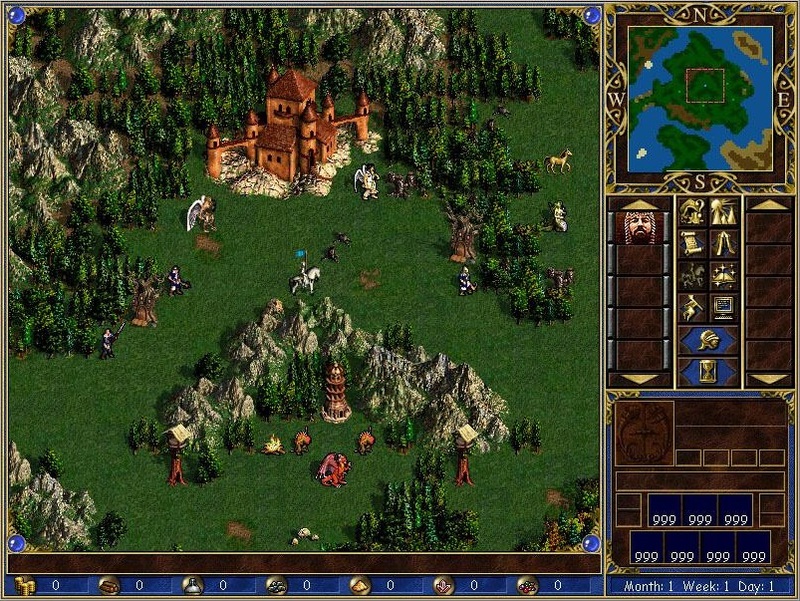 Since we were on a very tight development timeframe – fourteen months altogether – we decided to re-use the game engine that had been created for Heroes of Might & Magic II but added the new game features such as upgradeable fighting units, an underground level, a revamped magic system, and many more map objects to visit. However, David Richey completely revised the level editor so that the level designers had a very robust quest creation system they could use to create a wide variety of levels to explore and conduct warfare upon. I soon found that each of my leads were so talented and got along with each other so well that I realized I was working with a dream team the likes of which I have never again experienced in my thirty-five years in game industry. 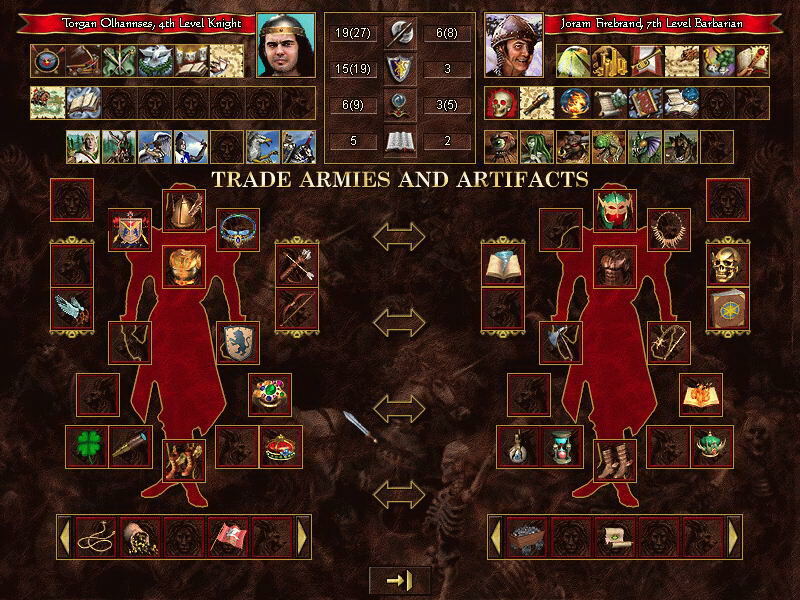 Greg Fulton worked very closely with Jon Van Caneghem on creating the stats for all the combat units and other game elements, modeling them first on Excel spreadsheets to test out whether verifying that everything was balanced before being programmed into the game. Greg also managed our assistant designer, Chris Vanover, who under the name “Sir Christian”, was our community manager and did a terrific job keeping the fans updated on progress with the game. In addition, Greg supervised our six-person level design team lead by Jennifer Bullard (Jennifer would later become assistant designer on Heroes of Might & Magic IV and took over community management under the name “Maranthea”). Systems programmer John Krause, whom I worked with at my previous company; multiplayer programmer Jeff Leggett; and artificial intelligence programmer Gus Smedstad soon supplemented our three-person engineering team lead by John Bolton. 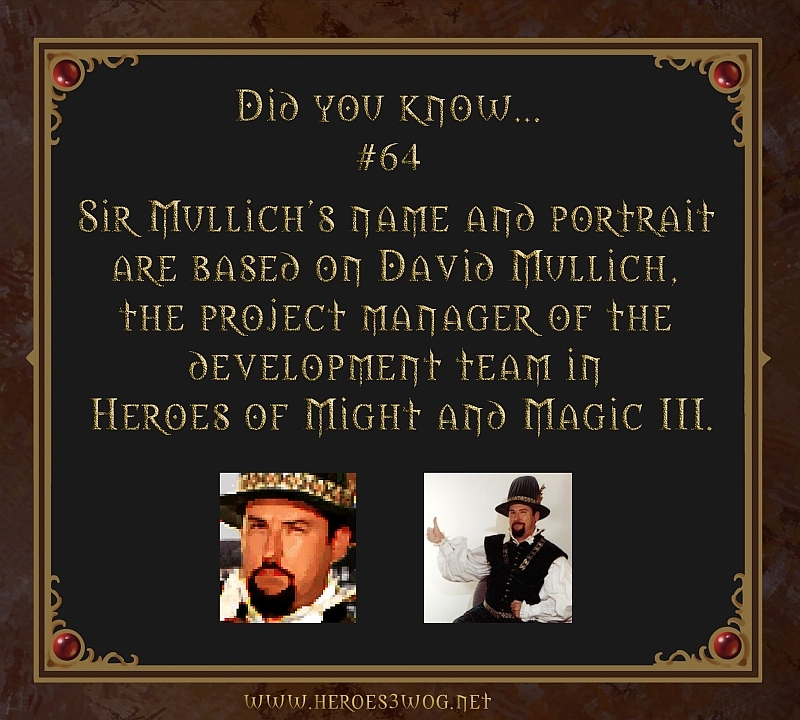 (Gus would later become both lead programmer and lead designer on Heroes of Might & Magic IV). As the deadline fast approached and we got into “crunch time”, even General Manager Mark Caldwell came in to join the programming action. I spent most of my time with lead artist Phelan Sykes and assistant lead artist Rebecca Riel, helping them adapt the twenty-person art team to the new art style as they created over 10,000 pieces of artwork for the game. Thankfully, the art team was more than up to the challenge, including illustrator George Almond, lead animator Adam McCarthy, user interface designer Scott White, and too many other talented artists to mention here. Phelan also oversaw the creation of the terrific cinematics created by our third-party vendors. I would be remiss if I did not mention audio lead Rob King, who with the assistance of Paul Romero and Steve Baca, created the game’s dramatic music, sound effects and voice over. I was lucky enough to be overseeing a very well oiled machine that actually required very little supervision on my part. I had few concerns when I left the project for a few days when my wife gave birth to our second son. When I returned to the office, my team surprised me by creating a new hero for the game, Sir Mullich, whose in-game description was, “Generally stoic, Sir Mullich is prone to spasmodic fits of uncoordinated excitement believed to intimidate his troops into working faster.” I was both touched and amused by this in-joke, and allowed them to keep it in the game. 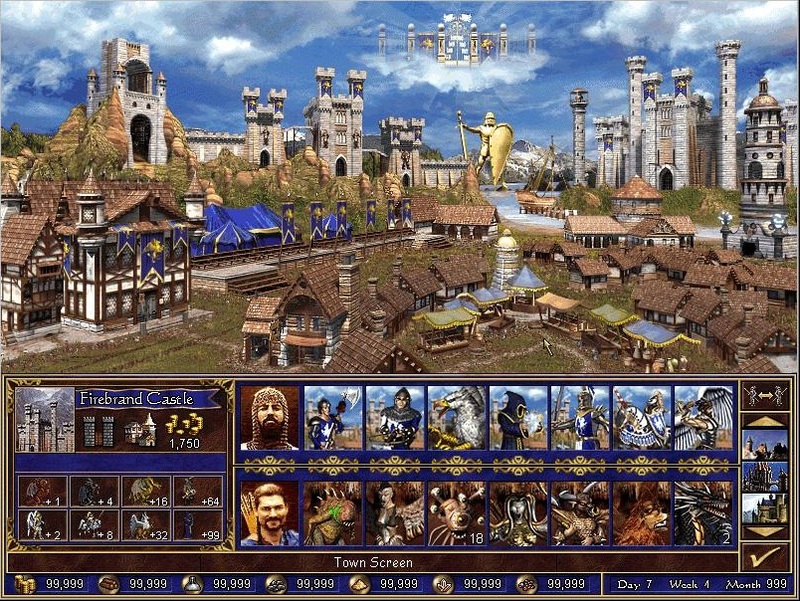 Heroes of Might & Magic III launched on February 28, 1999, in precisely the fourteen months we estimated it would take to complete, a rarity in game development. Even more amazingly, many fans and critics heralded the game as being better than its predecessor. But most of all, I’m proudest of the wonderful team with whom I was privileged to work, many of whom I still remain in contact with fifteen years later. These incredible game developers are the real Heroes of Might & Magic.